1. 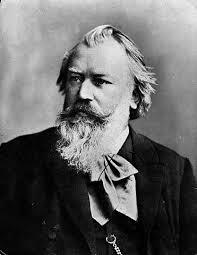 Johannes Brahms was born on May 7, 1833. His father was a town musician who played a variety of instruments, mostly horn and double bass. 2. Brahms began playing piano at the age of 7. By the time he was a teenager, he was helping the family financially by performing in inns, brothels, taverns and along the city docks. Brahms is also believed to have begun composing early in his life, but destroyed his early compositions. He did not become famous as a composer until April and May of 1853, when he was on a concert tour as accompanist to the Hungarian violinist Eduard Reményi. 3. In 1853, Brahms met Robert Schumann. Schumann was so impressed with Brahms’ compositions that he wrote an article in his Neue Zeitschrift für Musik, praising the young composer’s genius and heralding him as the one who could overthrow the New German School of Liszt and Wagner. 4. The New German School pushed the boundaries on chromatic harmony, musical structure and advocated for program music (music that has extra-musical meaning; it is meant to depict a story or narrative). Their opponents, musical conservatives like Brahms and Joseph Joachim, found this music to be over-dramatic; they were proponents of absolute music – music that is non-representational or not specifically about anything. 5. This conflict came to be known as the War of the Romantics. Both groups believed they were in the musical lineage of Beethoven. The conservatives believed that Beethoven’s greatness could not be surpassed; the progressives believed his music was the start of a new era. 7. Music historians believe that Brahms was in love with Clara Schumann. However, it is unclear whether the feeling was mutual. Even after Robert Schumann’s tragic death in 1856, Clara and Brahms remained only friends. Brahms never married. He was briefly engaged in 1859 to an Agathe von Siebold, who broke off the engagement. 8. While his compositional output was not nearly as numerous as Mozart’s or Beethoven’s, it was significant. He wrote several major works for orchestra including four symphonies, two serenades, two piano concertos, a violin concerto, the Academic Festival Overture and the Tragic Overture. He wrote over 200 lieder, several piano sonatas and chamber works for various string ensembles. Arguably his most massive piece and the work that put him on the map was his German Requiem, composed the year after his mother died. 9. In 1890 at the age of 57, Brahms decided to give up composing. However, he was unable to maintain his resolve because he ended up composing his Clarinet Trio Op. 114, Clarinet Quintet Op. 115, two clarinet sonatas, several song cycles for piano and the Eleven Chorale Preludes for Organ Op. 122. 10. Brahms developed cancer. His last public appearance was on March 3, 1897 at the performance of his Symphony No. 4 with Hans Richter conducting. The piece received a standing ovation after each movement. He died exactly one month later, on April 3, 1897 at the age of 63. Jacy Burroughs is the Assistant E-Commerce Marketing Manager at Sheet Music Plus. She has degrees in Horn Performance from the University of the Pacific Conservatory of Music and the University of North Carolina at Greensboro. She is a freelance horn player in the Bay Area. #Orchestral String Players always enjoy the warmth of Brahms compositions. Beautiful music.